Layout Managers were an huge benefit for Java Swing. They enabled software developers to program layout rather than to “drag and drop” it with some proprietary GUI builder. That’s nothing against a good GUI builder, but against the “source code” that gets generated as a result of using it. But after some time of playing and working with the layout managers given by Swing itself, we concluded that they weren’t up to the task. Since then, we were constantly on the lookout for new and better ways to tackle the layouting task. 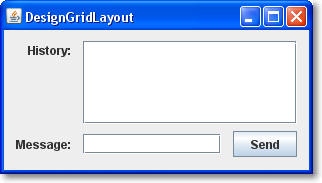 GridBagLayout – the most versatile layout manager included in the Java Swing core classes. It’s capable to handle virtually every layouting task, but the price is huge constraint setup code. Since the code bloats with even facile complexity in the dialog, it’s not maintainable once written. The advantages over GUI builders aren’t really present. StringGridBagLayout – has the same power as GridBagLayout, but with much more concise constraint definitions. It uses a string based domain specific language that you have to learn. After a while, you begin to feel a clumsiness when inserting variables into the constraints. TableLayout – was a new approach to layouting by applying a global grid to your panel. You define the grid by specifying row and column constraints. If you need special cell constraints afterwards, you can alter them, but it’s getting bloated again. StringTableLayout – provided a string based domain specific language over the TableLayout. It had some nice additional features, but lacked versatility with dynamic GUIs. FormLayout – was a great relief and a good companion for many full sized layouting tasks. By concentrating on a problem domain (form based layouts), it played out some advantages over general purpose layout managers. This layout is still in use here. MigLayout – the bigger brother of all these layouts. MigLayout comes with several pages of cheat sheets and you’re soon lost without it. It combines the approaches of all layout managers listed (and many more) and blends them into a massively powerful and versatile product. If you learn this layout manager thoroughly, you’ll never have to look elsewhere. But the learning curve is steep and the complexity of your code scales with the complexity of the GUI (which isn’t a drawback). All these layout managers added value to our GUIs and are in use until today, albeit seldom. Most of the time, your dialogs aren’t these super-fancy, highly dynamic full-page layouts every UI designer dreams about. If they are, pick one of the layout managers from the list and wade through the constraint setup. But let’s say you want to layout a rather plain dialog with some widgets, but you want to do it quick without sacrificing the looks. Here is a developer-friendly solution for this task: Use the DesignGridLayout manager. If you are interested in the possibilities of the layout manager, you should read the usage introduction page of DesignGridLayout. One big advantage of the fluent API when compared with the string based constraint definitions is the compiler and type system support. You can’t spell anything wrong and the code completion feature of your IDE guides you to the right method and parameter order. The other advantage is that you don’t need to mess with pixel sizes for spacing and such. It’s handled by the layout manager in the most comfortable manner. This is a frame with the panel we constructed in the example code above. The standard way to present graphical user interfaces (GUI) on a desktop machine in java is to use Swing. It’s a very flexible API with a steep learning curve and some oddities (e.g. EDT handling is cumbersome at least), beginning to show some age. There were several attempts to take the Swing experience to a new level, including the marvellous book “Filthy Rich Clients” by Chet Haase (we miss you in the Java camp!) and Romain Guy. So Swing isn’t dead or dying, it’s just getting old. One thing always bothered me with Swing: It is relatively easy to present a basic message or input dialog. But to add slightly more complexity to a dialog suddenly means substantially more effort. Dialogs don’t scale in Swing. If you ever “designed” an error dialog for your end user, presenting the essence of an exception that just occurred, you already know what I’m talking about. 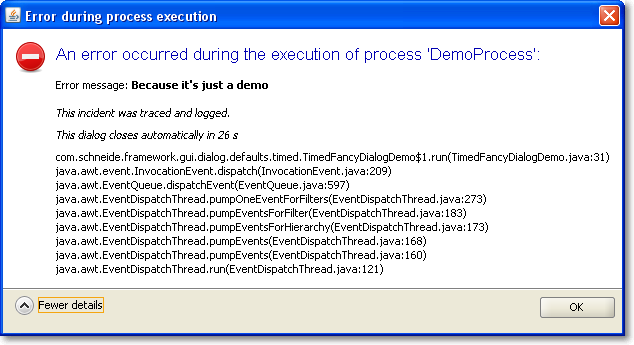 I have to make a confession: Our exception/error dialogs were nearly as nasty as the exception itself. But nobody wants to fail nasty. At late february this year, Eugene Ryzhikov published his Swing TaskDialog project on his blog. His release pace has been a new version once a week since then. So I’m writing on a moving target. The TaskDialog project provides basic message, progress and input dialogs based on the operating system’s “User Experience Guidelines”. The visual content is very appealing as a result. But the project doesn’t stop here. The programming API is very understandable and to the point. You don’t have to hassle with big concepts to use it, just look at the examples and start from there. It was a matter of minutes to replace our old, nasty error dialog with a much prettier one using TaskDialog. Here are two screenshots of it in action, with the detail section retracted (initial state) and flipped open. Notice the usage of Strings.toHtml() to convert plain Strings to HTML-rendered rich text elements. If you look at the presented information, you’ll notice it’s just a demo presenting a fake exception. But you’ll notice another thing, too: This dialog is about to close itself automatically soon. This is a speciality of our project: The GUI runs unattended by users for long periods of time. If you encounter an error every ten minutes and an user returns to the screen after a week, the system isn’t accessable without closing a million dialogs first. You might argue why a system error lasts for a week, but that’s a reality in this project we cannot change. So we came up with timed dialogs that go away on their own after a while. The information of the dialog is persisted in the log files that get evaluated periodically. The TaskDialog API provides easy integration for a GUI widget to be included in the dialog. In our timed dialog use case, it’s a JLabel, as highlighted in the code example at lines 16 and 17. A background thread periodically updates the text and closes the dialog when time runs out. But you’ll find examples with progress bars and other components on Eugene’s blog. The Swing TaskDialog project is a fine little gem to spice up your application. It’s API is simple, yet powerful and has proven customizable to our special use case. Finally, effort for basic dialogs in Swing scales again. // This will effect invalidation of the JTable and JTableHeader.